Piglets, like calves, are born without any immunity at all. To survive even just the first day, they must get colostrum within a few hours after birth. The antibodies in the colostrum absorb best within 4 hours of birth, and start to weaken soon after, and stop entirely after 24 hours. The piglets also need a dry, clean, and warm environment. New born pigs face many threats in today's production environment: diarrheas, join infections and skin problems are the most common. Good animal care can virtually eliminate the risk of piglet diseases. There are several bacteria causing different types of diarrhea. Most common diarrhea causing agents are Escherichia coli, Clostridium perfringens, Coccidia, Isospora suis and the rota virus. Diarrhea is always only a symptom, never the actual cause! Piglets under three weeks of age are susceptible to diarrheas, for they have no bacteria-killing acids in their stomach, and their mucuous membranes are underdeveloped. Vaccinating the sows is the only way to prevent some types of diarrhea. All sows must be vaccinated when they are inseminated for the first time, and again 2-3 weeks before every parturition. Diarrheas can be preventing to some extent by clean environment, protecting the piglets from cold and draft, hygienic handling of animals and by providing only clean feed and water. Coli is a common bacteria in the gut, but some strains of coli are pathogens. Commonly it infects piglets of 0-4 days of age, if they are axposed to the sow's feces. Coli diarrhea is very common, and lethal in piglets under a week old (diarrhea causes dehydration). Symptoms of a diarrhea caused by E. coli are liquid, brown feces, which often are spread to the walls of the pen. Vaccinating the sow is the only way to prevent and treat E. coli diarrhea, since then the piglets will inherit resistance for it in the colostrum. Cl. perfringes is a rather rare bacteria, which infects piglets 1-4 days of age. The bacteria lives in the intestine, where it secretes a strong cytotoxin, destroying the microvilli in the intestinal epithelium. Cl. perfringens is a sporulating bacteria, and it's spores are very durable against heat, draught etc. Destroying the spores from the piggery requires a careful and thorough disinfection of the pens. Vaccinating the sow is the only way to prevent and treat Cl. perfringens infections. Rota virus is a rare virus, which has strains infecting pigs and different strains infecting humans. Rota from pigs cannot thus infect humans or vice versa. Infects piglets 1-14 days of age, exposing the piglet to various bacterial infections (such as E. coli). Sometimes only the bacterial infection is recognized and treated, leaving the virus unharmed. Rota virus requires filthy surroundings and a piggery-wide decrease in immunity, but after it gets in to the piggery, it is difficult to get rid of. Isospora suis is a protozoan, which causes coccidiosis in piglets over one week of age. Like calves, piglets are susceptible to join ills (arithritis) caused by bacteria. The bacteria access the body either via wounds (often in the front knees), navel or from the bases of cut teeth. Having intact and safe pen structures and clean enough litter prevents infections. Joint ills can be treated with injecting antibiotics for three days, or in severe cases by having the piglet put down. Some piglets are born with very weak hind legs. Unable to stand up, they lie down with their feet spread (splay legs). This condition is partly hereditary, but slippery floors and low weight at birth add to the risk. If only the hind legs are affected, the prognosis is very good. Bandaging the hind legs together helps the piglet to control it's legs, and the animal usually heals in a few days. 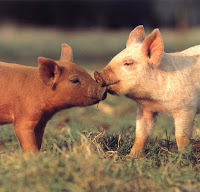 Piglets who have weakness in three or four legs have a bad prognosis, and should be euthanized. Greasy pig disease is caused by the common skin bacteria Staphylococcus hyicus. For weak and sensitive piglets S. hyicus can cause a severe skin infection (exudative dermatitis or exudative epidermitis). At first there are brown patches in the skin, which later becomes wrinkled, greasy and flaky. Deep scabs and lesions are seen in the skin. Greasy pig disease may be lethal, but can be treated with antibiotics if the causing bacteria is first identified. This condition has been well documented in The Pig Site.